The hotel is supposed to be 3 star and if it ever was it must have been pre elevators as i had to climb six flights of stairs with my wife's and my own suitcase as this place does not have elevators. We arrived at 11-00 in the morning to be told that the room would not be available until 15-00 at the earliest, the holiday was all inclusive but we were not allowed wristbands until 15-00 by which time we had missed lunch. When we finally got into our room we found it insecure in as much as the balcony doors did not lock properly, we also had no towels which meant another run up and down the six flights of stairs to reception. After obtaining towels which weren't the cleanest by any stretch of the imagination I inspected our room more closely to find a little friend dearly departed cockroach legs in the air beneath the cooker and sink in the kitchenette area. This poor creature was still there six days into the holiday and i have photos taken on different days to prove that the room was not cleaned for six days. We complained after one hour of being in our room that we wanted to be moved, the guy that I spoke to at A1 Travel told me that he would call me back first thing next morning. We then went for a drink at the poolside bar where i asked for two beers only to be told that i could only obtain one drink per person, this is ludicrous as my wife has never had to get her own drinks before on holiday at any all inclusive resort. We then looked for sun loungers only to find that there were less than 40 of them dotted around the pool area between approximately 200 paying holidaymakers. The next insult was the restaurant for evening meals, to call it a restaurant is a complete oxymoron as it was like a greasy spoon cafe except a cafe serves warm food as opposed to this place where very meal was virtually the same menu and the food was cold even on our first night when we were the fourth couple to enter the (restaurant)? as a result of this we ended up eating out on a daily basis and luckily for us there was good value for money down in the town. At 10-00 next morning I had not received a call so I rang A1 Travel and asked to speak to the said person, i was informed by the lady i spoke to that this guy was not in today until after 15-00. I asked if their employees were in the habit of lying to customers because he had clearly stated that he would call me back first thing in the morning. I then asked to speak to a manager and when i finally got a call back from him he said that he could not do anything for us until i have made my complaint official with the manager of the hotel which i duly did, however it was not until my penultimate day of the holiday that a portuguese local told me that my complaint would not be observed unless i signed the Red Book. I went to see the manager about this and she denied any knowledge of a Red Book until i asked to speak to her manager and she conveniently found it within two minutes. I then received a call back the next day offering us a move to another hotel but at the cost of another 500 euros or there about. The Jardim apartments are located on a hill, which means it isn't very suitable for parents with push chairs or elderly people. The foot paths are cobbled effect but very slippy. The apartments are 3-star, but very dated. The staff were very good, most of the time .They disappeared a lot, near closing time at the bar, after 11pm you had to purchase your drinks, then they seemed to be there, all the time. There were no reps on site, no daily activities at all. Drinks you could only get two drinks at a time, which was no good when there are more than two of you on holiday. The manager was a total idiot, a lady was ill, her partner wanted some bottled water to take back to their room, he was only allowed to take two small bottles back. Then return for some more after walking up a lot of stairs to get back to the apartment. He also cleared tables, whilst people were still eating. Breakfast was the same every day boring. Lunch and evening meal very good lots of choice. Hotel tip: check out reviews first.don't go lower than a four star. We arrived on Mon 16th Sept 2013 early in the morning and didn't know what to expect. It looked nice and reception was near to where the coach dropped us off. As we were early, our room wasn't ready for a while. We sat in silence in the reception area sweating and not once were we acknowledged by the staff. Once our room was ready, it was like doing an assault course as there were so many steps to our apartment. After sweating profusely we arrived and found the apartment to be basic but ok.
Fast forward to the evening and being All Inclusive meant food and drink was served all day. We had lunch and toured the grounds. Very very steep and hard to manoeuvre around if elderly. Dinner was basic. Variety was ok but nothing spectacular that couldn't be had in my own home in the UK. The grounds were very dimly lit and a bit scary if you had to walk to your apartment on your own. Our apartment was also dimly lit and needed proper lighting. The next day we decided to do the '10 min' walk to the beach. Damn!! The steep decline/incline took forever to do. Very arduous if elderly and non fit. Old and tired! Booked all inclusive, was not like any all inclusive hotel I have ever stayed at! Breakfast was good and buffet menu from snack bar at lunch, same for the evening meal. The hotel was more like Portuguese accommodation, with empty rooms rented out, parasols death trap, pool needs maintenance broken tiles so plenty of cut feet. I have to say the staff at the bar and restaurant were lovely but that is the only good comment i can make. There were cockroaches in our room. I liked the location but no good if you can't climb steps, height of season, one night a parrot show at 10, one night a group, one night karaoke which was setting up after 10pm only myself and son in bar, place is dead and the all inclusive ends at 11. I booked this holiday on the internet, we were self catering, we ate a few times in the restaurant food was good, staff pleasent and helpful, staff in the bar not very pleasent, so we did'nt return to the bar. Location, definatly not suitable for people with walking difficulties. No entertainment what-so-ever, which is much needed! I would not visit these apartments again. Travel operator: On the beach. We booked our studio appartment in the Jardim 1 as part of a last minute package so were not sure what to expect although having been told it was a 3 star we would have hoped for a slightly better maintained complex than we were greeted with. we can relate to the review earlier on this page where we stood in our living area and questioned where on earth we were going to sleep!!! The beds are under the rather old faded and drab sofa, after some shifting and rearranging of furniture we had just about established a rather basic sleeping area and the cushions were quickly removed and placed in a cupboard never to be touched again for the duration of the stay! To say they were old and worn would be an understatement! on entering the bathroom i was transported back to the early 70s with some very "tasteful" decor that im sure would have been lovely in its day although that day is long gone!! The toilet could have done with a new seat, preferably one less discoulored and the shower, well you needed a degree in physics to get the balance right between the waterpressure and the shower head staying in its holder whilst still directing water to a position that you could actually stand under... all this without drowning the odd cockroach on the bathroom floor that may have escaped from the air vent that had previously been blocked with toilet roll in a rather DIY fashion!!! However, after getting over our initial shock, we made the best of the appartment which apart from the bathroom was clean enough and the views were excellent! Old Albufeira in our opinion was the best side of town and still has an array of good bars and restaurants, the hotel staff were fine, and the maids very pleasant.. we didnt experience the entertainment as we spent every evening in the bars in the Old Town. The walk home was tiring but good to burn of the beer calories, not recommended for the elderly or young children though... also be wary of the slippy roads and pavements especially if it rains during your holiday. Overall, would go back to Old Albufeira, probaly not to these appartments as you could get better for your money. we would just like to say please never book a holiday at this hotel!!! it was supposed to be an excellent family holiday previously booked a year in advance but turned out to be a disaster, wanting to return home immediately from entering our apartment. the first thing we were greeted with was a foisty, dingy room which the door had been kicked in - we went straight back to reception to ask to exchange rooms whom i can say were not very helpful. we were then offered the only room left available right at the back of the complex in among all the riff raff which we later found out this room also stunk. when we went in it had other peoples hairs still left on floor, fridge handle off, fridge propped up with cardboard, bedding not clean, mirrors covered with splatter no hot water for two weeks had to boil pans not on more than two rings though as electric would trip and underneath our beds was dust fluff balls which god knows how long they had been there. had to pay for mattresses everyday and pools were totally taped off for one day due to them not putting the chlorine in them. the only pleasant thing was some but not all of the waiters around the pool. Our stay didn't get off to a very good start as the two older women on reception were very rude and abrupt. We had booked our apartment independently and when we asked for directions to our block they told us we could not stay as the hotel owned all of the apartments and we would not be allowed to stay. This took us 50 mins. of debating,arguing and a very expensive mobile call to the U.K. (as they would not allow us to use the phone) to eventually resolve. When we did get to the block it was right at the top behind the tennis courts with overhead cranes working all day Mon. - Fri. drilling,hammering etc. The studio was quite small and rather dated and the entrance had a permanent musty smell. The snack bar by the pool was fine and the staff friendly as were the bar staff and you do expect it to be a bit more expensive by the pool. The location suited us even though it was a steep 10-15 min walk from the old town but a lot of families were complaining about how hard it was with kids and buggies. The entertainment was karaoke three nights a week and was sometimes that bad it was good! Kids weren't impressed by the games room as the air hockey had no air, two pool cues (one without a tip), no chalk and the machine three boys were putting their money never worked. Overall we felt that this hotel was probably a huge entertainment complex in it's heyday but was now past it's prime. Having booked the apartment first then reading the reports on this site. I went fearing the worst. What a pleasant suprise I got. I was in block B1 at the front of the complex with the pools and reception behind. The apartment was clean and well equipped with fabulous views out to sea and over the old town. The complex is on a hill but nowhere as near as steep as reports made out. If you entered the complex via the main entrance, where the cars turn in you can avoid the path up the embankment. The entertainment is not the best but you are 10 mins walk from the town square where there is fantastic live entertainment in many of the bars. The complex is also only 10 mins from the fantastic beaches. I would certainly return here and definitely recommend it to friends and family. Hotel staff apart from middle aged man very surly. Apartment what we expected,probably built in 1970s.lots of steps to apartment,need to be fit.Cleaned every day,but could have used bleach to clean floor after daughter sick in the night. No toaster,kettle. Ate at restaurant ,part of complex ,expensive but freshly made. 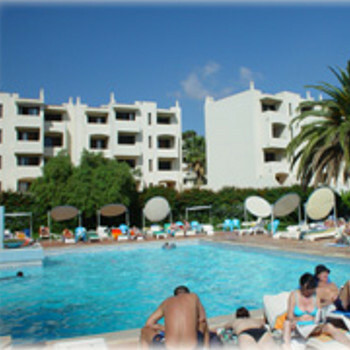 Pools clean,not many other guests staying at the time so sunbeds available pretty much all time. Kareoke only entertainment. Word of advice ,don't book a taxi to take you to airport in the town,didn't turn up. However, man on reception gladly rang one for us and was there in 5 mins.